Attorney General Jeff Sessions met Russia’s ambassador during the election despite telling his confirmation he had “no communications with the Russians”. The justice department confirmed he met Sergei Kislyak in July and September last year as part of his role on the Senate Armed Services Committee. Donald Trump’s attorney general Jeff Sessions twice spoke with the Russian ambassador to the United States during the presidential campaign. The Washington Post, citing justice department officials, first reported that Sessions met with Russian ambassador Sergey Kislyak once in September 2016, when US intelligence officials were investigating Russian interference in the presidential election, and once in the summer of that year. The US woke up on Thursday to a “triple whammy” of new media reports linking the Trump administration with Russia, throwing the White House on the defensive and sparking fresh calls for a formal investigation. 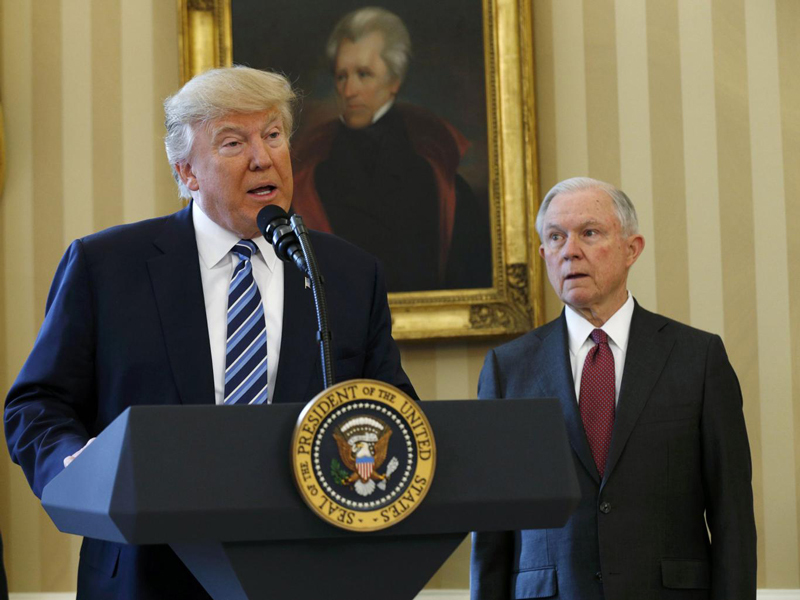 The most significant of the claims – that Donald Trump’s new Attorney General, Jeff Sessions, met twice with the Russian ambassador during the 2016 election – was first reported in the Washington Post. Jeff Sessions, the US Attorney general, had two conversations with the Russian ambassador to the United States while still a senator during the presidential campaign season last year, fuelling calls for him to recuse himself from a justice department investigation into Russian interference in the election. Just three weeks after being confirmed as the nation’s top law enforcement officer, Mr Sessions is facing calls from senior Democrats to resign after failing to disclose the interactions. Attorney General Jeff Sessions met with Russia’s ambassador twice last year during Donald Trump’s campaign run but claimed during his Senate confirmation hearing that he ‘did not have communications with the Russians’ in his capacity as an adviser to then-candidate Trump. Despite being asked by Minnesota Democratic Sen. Al Franken about contacts between Trump’s campaign and Russian officials, Sessions declined at the time to mention his private conversations with Sergey Kislyak during the Republican National Convention in July and subsequently in his office in September, The Washington Post reported.